Even as the good people of Lützelhard celebrated our army’s glorious victory over Dautenstein with vast quantities of beer, sausage, and sauerkraut, I was called to an audience with Markgraf Maximilian himself. 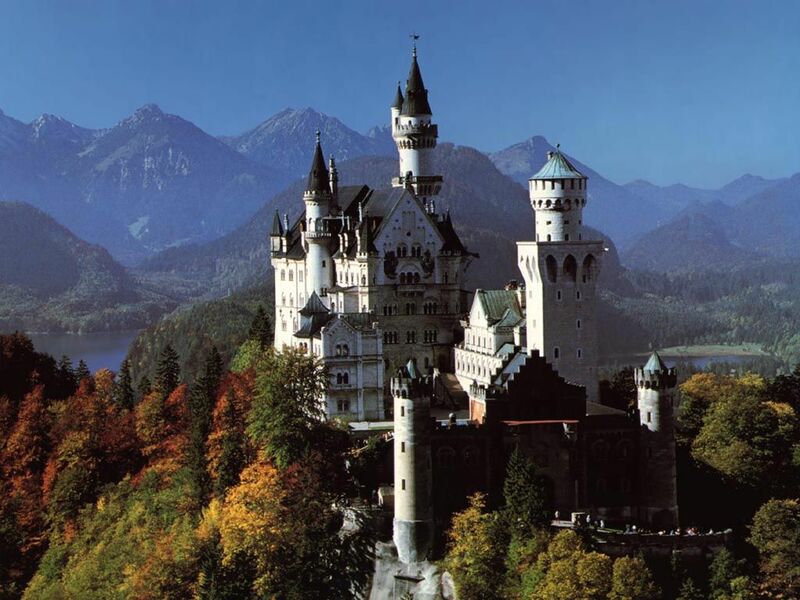 I hurriedly polished my boots, straightened my medals, and rode with my aide-de-camp to the Schloss, where the Margrave was waiting for me in the audience chamber with his many obsequious ministers and advisors. His advisors all nodded eagerly, each fearful that anything less than enthusiastic approval might see them demoted to inspecting pigs in some backwater village. The decision had been made. As a loyal officer of Lützelhard, it was my duty to obey. I returned to at once to the army in the field, together with the reinforcements that had been provided to me. Rather than take the most direct—and well-guarded—route to the grand burg of Dautenstein, I decided on a more indirect approach. We would attempt to surprise the enemy by pushing through the thick forest of the Dunkelwald. 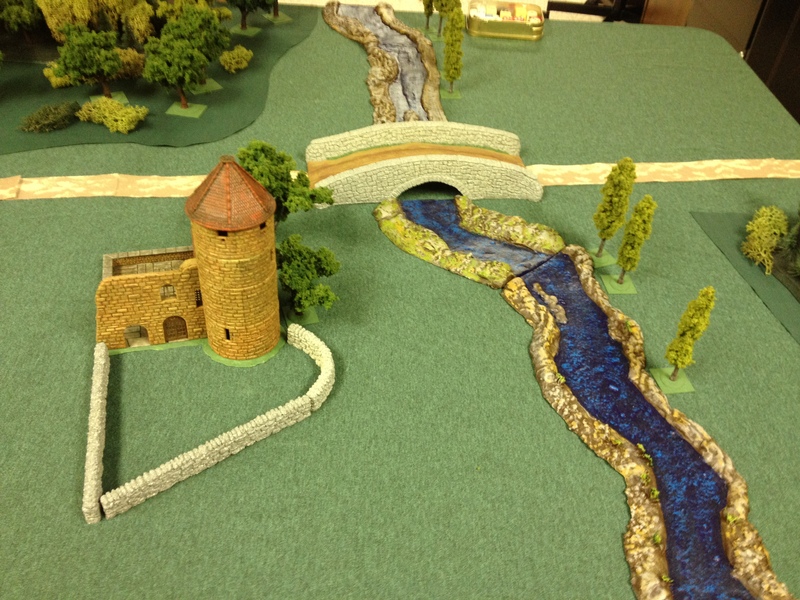 We would then seize the strategic road junction at the village of Wegweiser, as well as the bridge over the nearby river. From there, we could advance on the capital. At first, all went well. However, as we advanced further into the enemy’s territory, however, I grew concerned that our movements were being reported by spies among the local peasantry. Sure enough, as we approached Wegweiser the enemy drew up his army to block us. 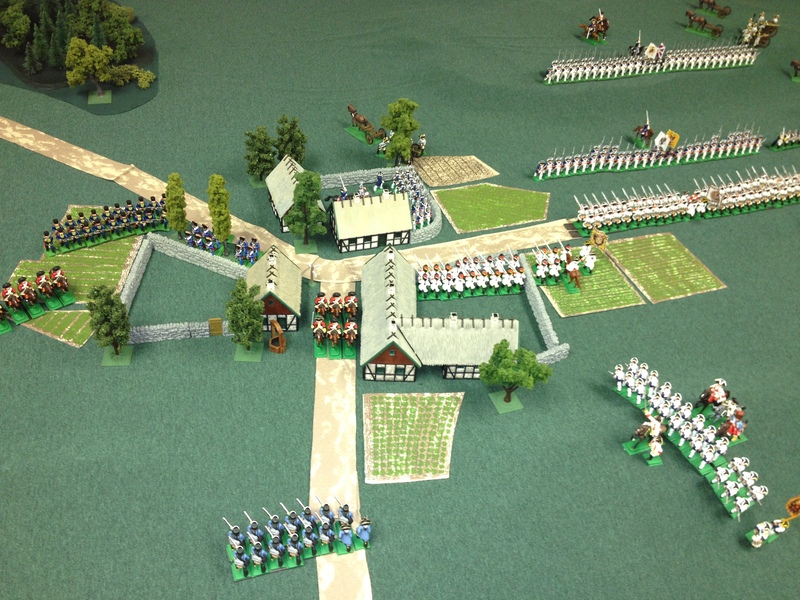 Once again, I would face the formidable General Alan von Scheunen on the field of battle…. Unsure of the enemy’s strength, my initial plan was a simple and largely reactive one. On the right, two gun batteries of the Schwerefeldartillerie-Battalion Gräfin Alexandra together with the Grenadier-Kompanie would take up position on a low hill to anchor the main line of my army. The musketeers of the 1st and 2nd Infantrie-Regiment Markgraf Maximilian von Lützelhard would form the main line, reinforced with two more gun batteries. The 3rd regiment would be held in reserve. The plucky light infantry of Feldjägerkorps Dunkelwald would seize the village itself, closely followed by the Grenadier-Battalion d’Urfé. Finally, four squadrons of light cavalry of the Husaren-Regiment “Killerhasen” would take up position on my left wing to protect the flanks of the Jägers, while the Dragoons of the Reiter-Regiment would deploy on the right. This strong line would, I hoped, both withstand and inflict heavy damage upon the enemy’s initial assault—at which point I would throw my reserves into a counter-assault at the weakest point. Plans, alas, rarely survive contact with the enemy. 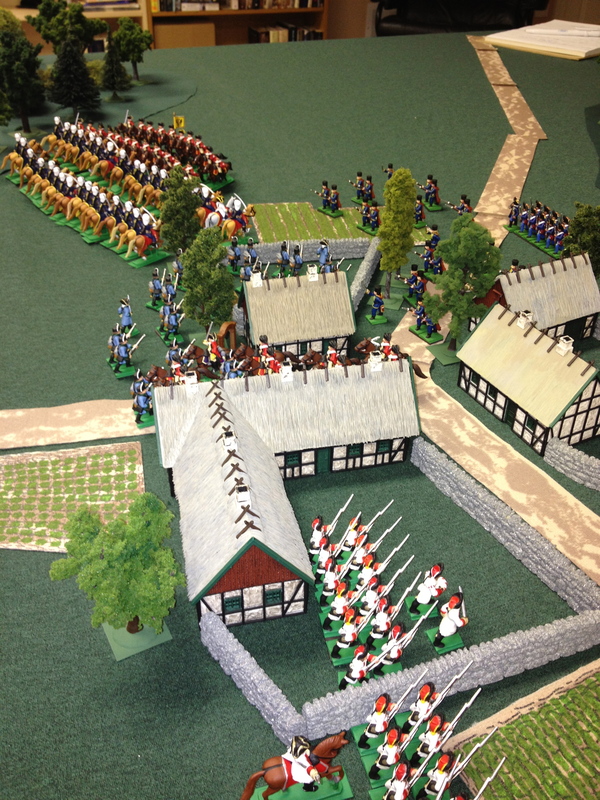 On the left my assault on the village went forward, but against much heavier opposition than I expected. 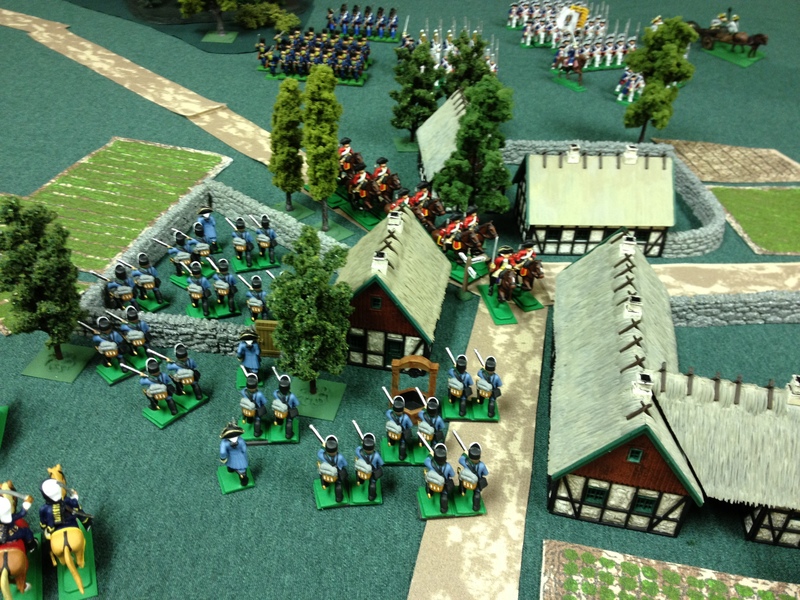 As the Jägers moved forward they could see no less than four battalions of infantry bearing down upon them, backed by a regiment of heavy cavalry. 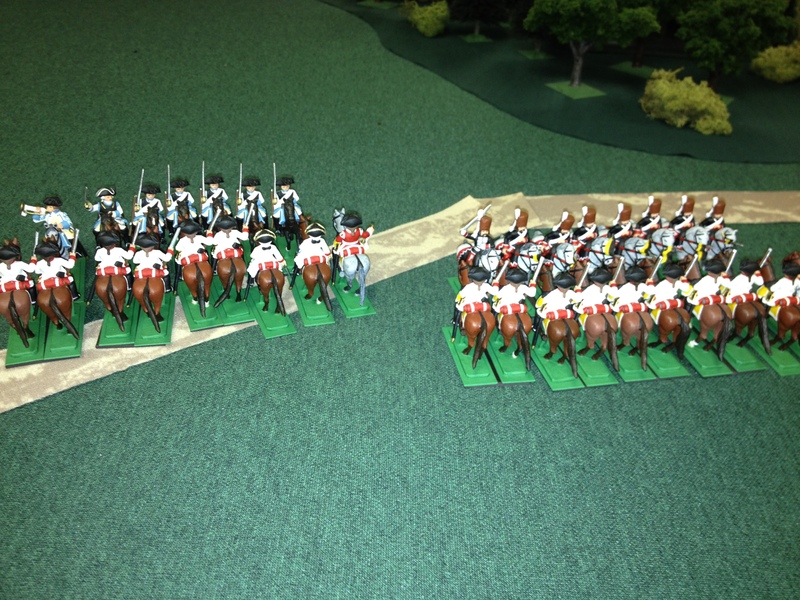 The Hussars galloped forward to meet the enemy riders…. 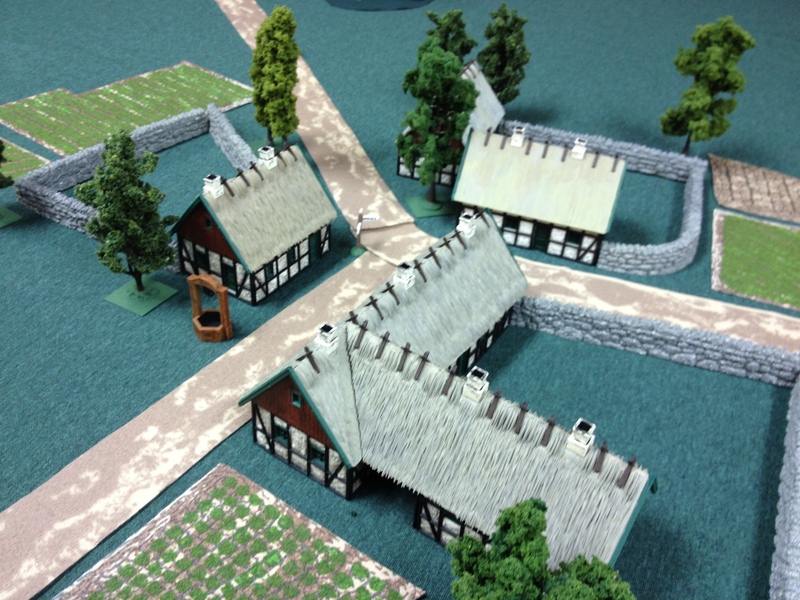 As they did so, however, a squadron of the enemy’s forces broke away from the main body to charge down through the main street of the village, clearly hoping to break through the Jägers and penetrate my position. Showing the same steely courage they had displayed a less than two weeks earlier at Kleinen-Kreuzung, the tenacious soldiers of the Feldjägerkorps met them with rifle fire and bayonets. The enemy threw in a battalion of fusiliers in an effort to break the brave hunters and woodsmen of the Dunkelwald, but to little avail. Eventually, both sides would fall back—winning enough time, however, for my Grendaiers d’Urfé to take up position in a walled courtyard overlooking the main road. From there they began to pour volleys of musket fire into their opposite number. Unfortunately, the Hussars fared rather less well, suffering heavy casualties from their heavier opponents. To my great disappointment, they then routed from the field—leaving the farthest portion of my left flank exposed. Some were even taken prisoner, and led away. It was indeed fortunate for me that the enemy heavy cavalry were too exhausted to immediately exploit the opportunity. 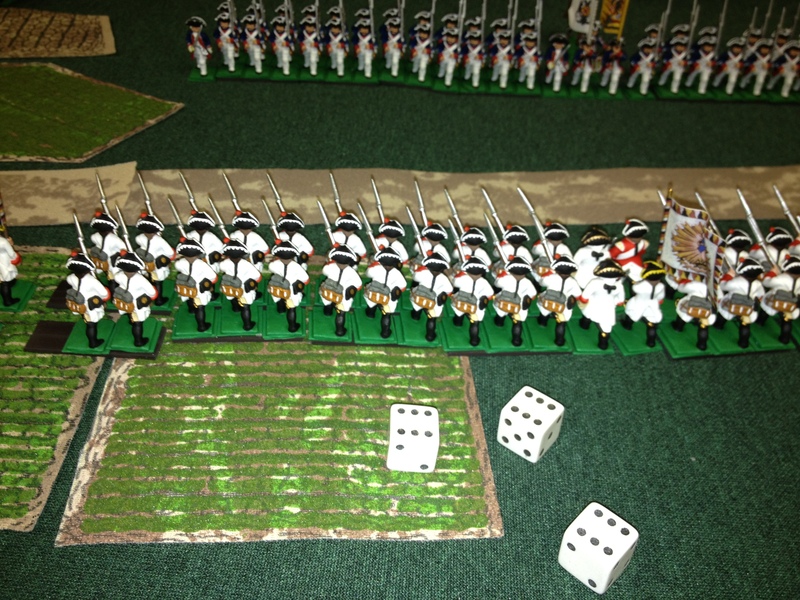 On the right flank, my Heavy Dragoons fared rather better. They swept forward and charged two squadrons of the enemy, cutting them down. 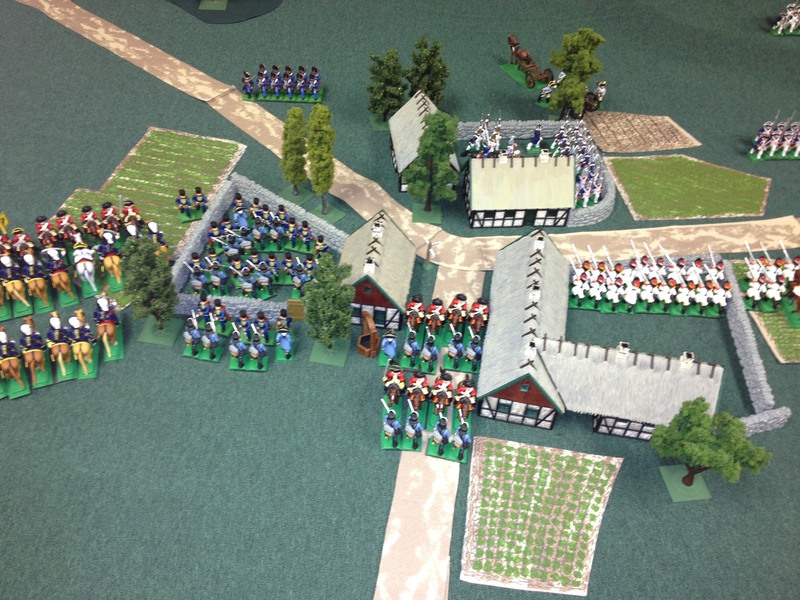 In the centre, the Grand Dutchy’s well-drilled troops and guns moved forward in columns either side of the central ridge, and began to deploy in line facing our forces. I third regiment stood in reserve on the hill above, together with two more batteries of guns. I sensed an opportunity, and threw my own line forward so as to bring the enemy’s manoeuvres under musket fire. Having insisted that the men be sober for battle, our fire was devastatingly accurate. Many scores of the enemy fell. As our muskets thundered at the foe, I rode back to assume personal command of a battalion of the Infantrie-Regiment Markgraf Maximilian von Lützelhard. Urging them at double time, they quickly redeployed to our faltering left flank. As I did so, the Jägers fell back towards my position. Within the village itself, the Grenadiers d’Urfé continued to trade volleys with the enemy’s troops, gradually getting somewhat the better of the exchange. On the right flank, the ever-impetuous Heavy Dragoons of the Reiter-Regiment spurred their horses to a gallop, and charged a battery of the enemy guns. 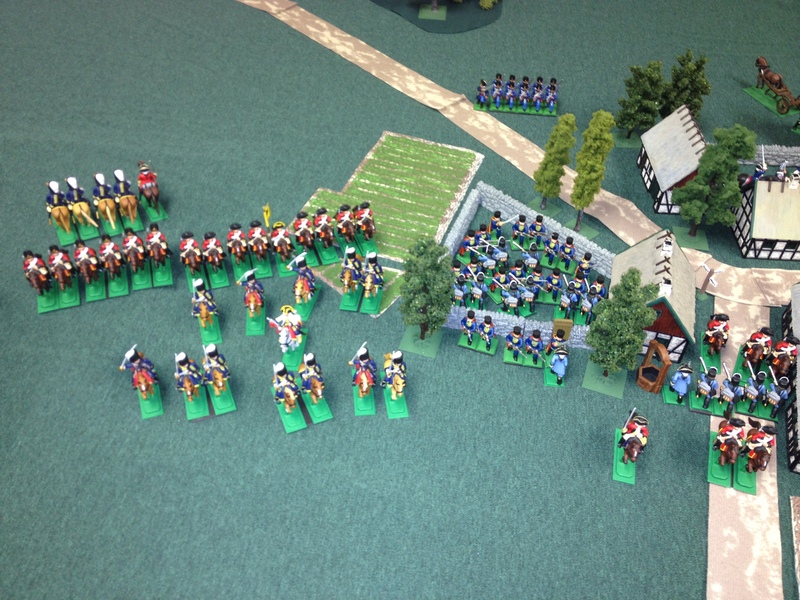 Unfortunately, the Dautenstein gunners showed their legendary discipline, and let forth with a blast of grapeshot as the Dragoons drew close, all but wiping out the brave cavalry. 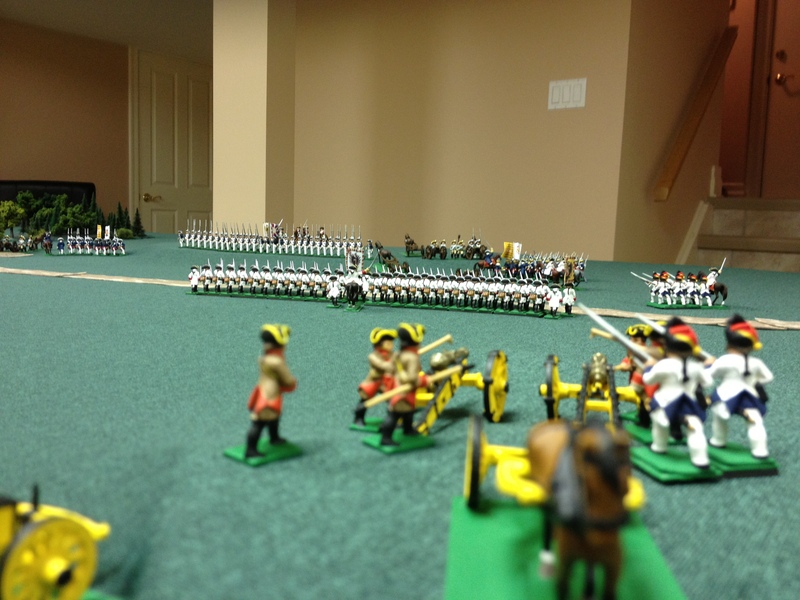 However, the exchange had given my own infantry enough time to approach within musket range. They soon shot down the enemy artillerymen. Finally, the Dautenstein centre began to falter, and retreat. I was in no position to pursue, however. The 1st Infantrie-Regiment Markgraf Maximilian von Lützelhard had itself suffered heavy casualties from enemy musket and roundshot and also began to fall back, while my left flank was partially compromised. I too ordered a general withdrawal as our guns fired a few final parting shots at the enemy. The inconclusive battle had come at a bloody cost. The fields were littered with the dead and dying: my forces had lost some five hundred cavalry, and almost nine hundred infantry. 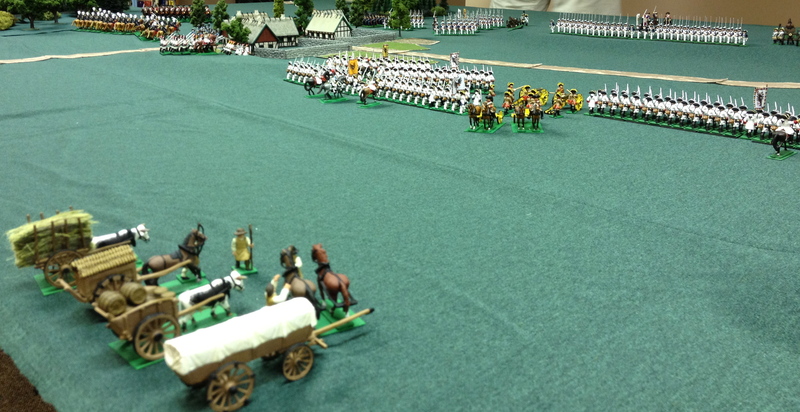 The enemy losses were lighter in cavalry, but heavier in infantry and artillery. With the exception of the Hussars—whose commander was stripped of his commission, and assigned to the ranks—the men had fought well. However, I was presented with a challenge. Should I push onwards immediately with my now-weakened force, hoping to engage von Scheunen before he could either fortify his position or receive reinforcements? Or should I await my own reinforcements, and then advance with a stronger force? wonderful, engaging, authentic and riveting. Thanks for writing these. A riveting tale of reluctant battle in the Napoleonic era. Wonderful read. P.S. Why can’t I write like this! Somewhat earlier than Napoleonic, but thanks!